KANSAS CITY, Mo. -- The Royals earned another champagne shower at Kauffman Stadium. Lorenzo Cain sprinted home from first base on Eric Hosmer's single in the eighth inning, Wade Davis weathered a 45-minute rain delay and a white-knuckle ninth, and Kansas City beat the Toronto Blue Jays 4-3 Friday night to earn its second straight trip to the World Series. Jose Bautista's second homer of the game, a two-run shot in the top of the eighth, lifted Toronto into a 3-3 tie. But any momentum Toronto might have had was washed away when a line of rain swept through town, sending players and fans scurrying for cover. After the delay, Cain promptly worked a leadoff walk from closer Roberto Osuna, and Hosmer followed with a clean single that Bautista fielded down the right-field line. It was up to Davis, who got the Royals out of a jam in the eighth, to finish it off. Davis gave up a single to Russell Martin and walked Kevin Pillar before striking out pinch-hitter Dioner Navarro. After stolen bases put runners on second and third, Davis struck out Ben Revere, then got Donaldson on a bouncer to third. Kansas City shortstop Alcides Escobar was voted the ALCS MVP after going 11 for 23 (.478). 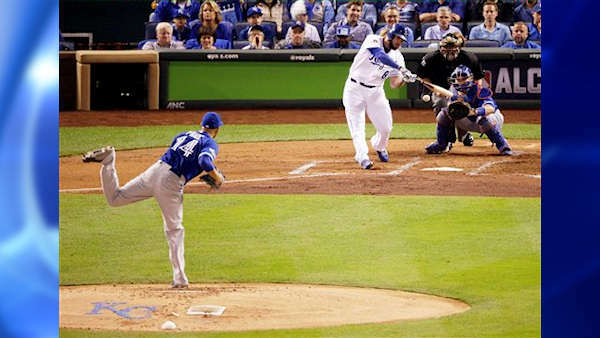 And for the fifth time in two years, the Royals clinched a postseason series at home. Ben Zobrist and Mike Moustakas homered, and Alex Rios also drove in a run for Kansas City, which ended an embarrassing 29-year postseason drought just last season. The Royals eventually swept their way to the World Series, where they succumbed to the San Francisco Giants in Game 7 with the tying run standing 90 feet away. Kansas City will try to do one win better against the Mets. They simply couldn't win their sixth straight elimination game. The Royals wasted no time taking the lead off David Price, the Blue Jays ace who has been so good during the regular season but remains winless in eight career postseason starts. Zobrist pounced on the tall left-hander in the first inning, pulling a 1-1 pitch from his old Tampa Bay teammate down the left-field line. Zobrist's second homer of the series gave Kansas City the lead and sent a capacity crowd of 40,494 into a towel-waving frenzy.